Josh and Danny are twins – but they’re far from identical. Josh loves creepy-crawlies (as Danny would call them). Danny could “win the Under Nine Dancing Competition” for his bust-out moves when a spider lands on his shorts. That’s all about to change when the boys follow their dog Piddles under a hole in the fence into their mysterious neighbour’s back yard and they end up in Petty Potts’s lab. Accidentally covered in S.W.I.T.C.H. (Serum Which Initiates Total Cellular Hijack) set out for Piddles, the boys escape and run back home. They climb into the bathtub to wash off the yellow goop clinging to their legs, but they’re too late. The bathtub grows huge as they shrink to spider status. The adventure grows even larger when their sister Jenny flushes them down the drain and a pair of surprisingly wise and friendly rats come to the rescue. Spider Stampede, the first of six S.W.I.T.C.H. titles (originally published by Oxford University Press in 2011), is a captivating blend of science and fiction. The author effortlessly weaves scientific detail into the story. Simple black-and-white line illustrations add humor and interest. The first in a series, this chapter book introduces the cast of characters and sets up the motivation for the seemingly mad scientist that is Petty Potts. At the end of the story – once the boys are safely transformed back into eight-year-old humans – Petty Potts’s diary entry fills in a few more storyline details. Readers will quickly realize the story is far from finished! Second grade readers will be hooked. There’s also a two-page glossary of scientific terms used throughout the book and recommended reading pages including both books and websites to expand reading skills. 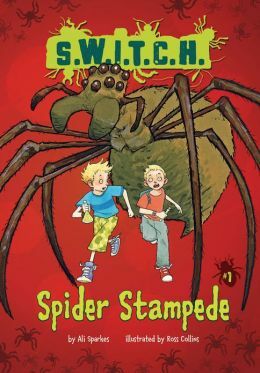 Spider Stampede is fun, fascinating, and full of fantastic science facts. It’s a clever second grade level chapter book that promises to be a thoroughly entertaining series! Cousins Lulu and Mellie return for book number two in this delightful and entertaining series. Like the first book in the series, Lulu and the Duck in the Park, this is destined to appear on many reading lists and receive many awards. The publisher’s website has a Common Core Teacher’s Guide for the series, providing many reading activities (http://www.albertwhitman.com/). Lulu’s family is going on a week-long beach vacation, and Mellie is going along. The house they rent is comically inadequate, complete with a potholed road and only three glasses in the kitchen. The locals have been fighting a battle with a stray dog which seemingly came from the sea. Lulu gets the full story about the dog’s mother and sisters and how they were eventually captured by the dogcatcher. Predictably, Lulu ignores all the warnings and befriends the dog from the sea. He remains wary of other humans, but that doesn’t stop him from saving the day. The author uses gentle humor and a little self-deprecation to show how things can sometimes go awry. Delightful illustrations show much of the action and are wonderful additions. 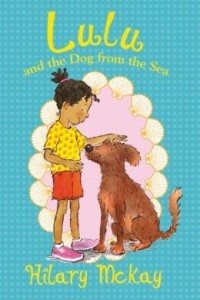 Second grade readers will learn, in a fun way, about many issues facing young vacationers. They will learn that rocks on the beach belong to everyone and should not be appropriated by individuals. Trash must be protected from critters, even if humans don’t think the critters are clever enough to access the cans. Craft projects, such as kite building, often require some instruction. Even thieving dogs require attention and water. A thoroughly enjoyable early reader.